Welcome back to Fowler’s Wells for our 8th home game of the season and 17th game in total. It’s been a good couple of weeks for Chobham. On 3 January, we hosted our close adversaries and the London 1 form team Sutton & Epsom. Over recent years we have had some right royal battles with our local rivals with the result being in doubt right to the end. Well this one was no different with Chob taking the spoils and winning a thrilling game. It was our turn to burst S&E’s 11 match unbeaten bubble gaining some revenge for them taking away ours when it stood at 22. Despite the unsporting weather which was probably the worst we’ve had this season, both sets of players served up a very high quality encounter and I think if we hadn’t have secured the victory we would have been very disappointed. To me, there were two very important and massively positive aspects of our performance that emerged that afternoon. First, our growing self-belief and secondly but hugely important, the depth of our squad. Unusually, we had to cope with our entire back row being found unavailable on the morning of the match. This would send most clubs into a tail spin and render a major weakness in the team but we had three guys step into the shirt and perform right at the top of their game. Despite the Cannons being depleted, they also won well against S&E. In relation to my first point, after 15 minutes we were 10-0 down, not good on a day when you don’t want to be chasing the game. We didn’t panic or try to play catch up rugby, but kept our shape, visibly ratcheted up the physicality of the set piece and put Sutton right under the cosh. This brought both pressure and points and by half time there was only 1 point in it. The second half was similarly successful. 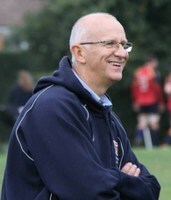 On the people front it was great to see Alex Seers back in a Chobham shirt looking as composed and assured as ever. He is certainly benefitting from the conditioning environment at Cardiff Met – you see it’s not all lager and curries at uni! Also congratulations to Lewis Manning who notched up his 50th appearance with a barnstorming performance. Harry Guy was also able to celebrate elevation to Centurion status with a win. Promising youngster Jerry Rumball also joined the 1st XV squad for the first time. So the bandwagon moved onto Basingstoke. Similar theme, decent opposition, tricky conditions, previous victors at Fowler’s Wells etc. Well, fortunately there were no banana skins as an assured and composed performance for 60 minutes provided a dominant platform for a bonus point win. This win has moved us into 2nd spot. Congratulations go to Ollie Wakefield who made his 1st XV debut and also Liam Cranford’s Cannons who were mighty impressive in their excellent win at Basingstoke. Watching the 2’s it is clear that we have a talented, young player group in that side that is benefitting from playing with a core of experienced guys. It is terrific that they are being given the opportunity but also developing into excellent players under the tutelage of our first class coaching group in place right across the senior section of the club. We also saw some more of that when we entertained the Welsh Guards recently under floodlights in a closely fought encounter with a mixed Devils XV. So to today and our visitors Dover. Well, we reversed our recent run of results down on the Kent coast in a close fought victory in October. We know that Dover will bring commitment and physicality to today’s game and will be looking for a result to keep themselves out of the drop zone. Ryan and Tony will have the guys focussed and raring to go to keep the pressure on those around us in the table. The touchline will be really important and the players will as ever be grateful for your support in cheering us onto victory as our 16th man.